Baldinger Architectural Studio is designing a new concept call “The Truck Yard”. 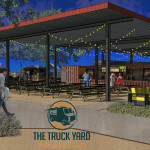 The Truck Yard is a family oriented, food based, entertainment venue to operate year round in the Phoenix metro area. The proposal calls for an outdoor “dining room” under the dense canopy of a tree grove. Food is served by ten food trucks parked in designated stalls with utilities hook ups. In addition to the park-like setting, it features an indoor bar, stage, amphitheater for viewing food centered events, kids and adults play areas and beverage stations. The transient nature of this project makes it fitting to use shipping containers as building components. 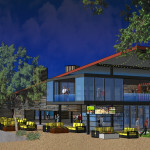 The use of shipping containers is being proposed throughout the park.